Here we are with part 3 of the ongoing process with the Roku port! 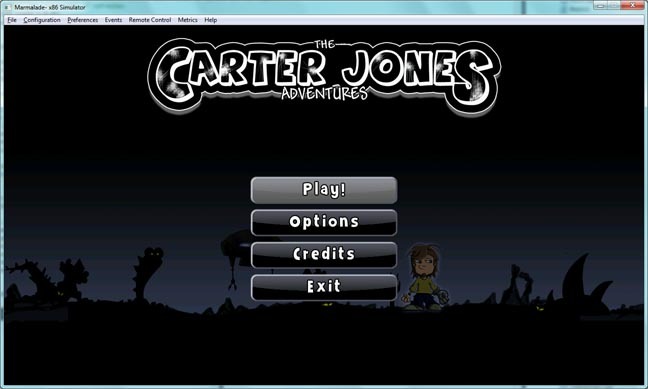 First a small note: each of these posts describe a step in the process of bringing the Carter Jones Adventures to the Roku device, however please keep in mind that I can not spend more than about an hour a day on this project because I have a family and day-time job to take care of as well. Thus, each post represents about an hour of real work. calls to pick up on the keypress events and we had a game running on the big-screen. Check my Twitter (also on the right of this page for a neat picture of my TV with the Roku just visible on the bottom right). Nice, I could play the first level, albeit with some hick-ups and weird initialization things going on! Next step was developing some logic for handling the navigation in the user interface. Carter Jones was built for touch-devices and my TV certainly is no touch device. So, I started on the title-screen, introducing something of a ‘focus-concept’, where I highlight the selected user interface element and when OK is pressed a ‘tap’ is registered on that element and the corresponding logic is executed. I could have made some nice generic framework code to handle this, but because the number of user interface elements in the entire game is relatively small I decided to program this out for each screen separately. This will be a bit more manual labor but it is a proven solution and it does the job (I always tend to embrace the KISS principle here, even if it means a little more ‘work’ for me). So for now, the title screen is ready. The following screens are still on the to-do list: levelselect, credits, options1, options2, gamescreen, game-over, level finished. I think I can probably delete the option screens because I can’t adjust the sound from my code and there is no touch-screen, so that leaves little to configure! Vorige: Vorig bericht: Roku development II: unlock your device!